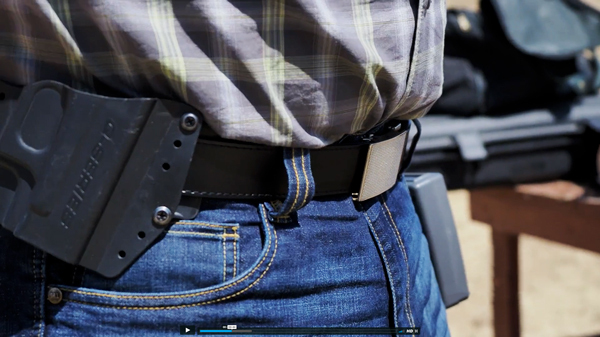 Nexbelt: A Gun Belt For the Modern Times? Every so often a product comes along that has the capability of really changing your world … and by that, I mean that this concealed carry belt, from Nexbelt, is one of those products that has had a subtle, but significant change in my day-to-day life. Nexbelt released their unique ratcheting belt system a few years ago. It is truly revolutionary because it gets rid of the centuries-old method of relying on holes punched through leather. Of course, we also have belts that are infinitely adjustable via the use of cam buckles and/or loops. Nexbelt takes it all a step further. It is almost infinitely adjustable … okay, maybe not infinitely, but at least in 1/4” increments. It is user adaptable and sizable, as it incorporates a clever ratcheting mechanism that is embedded into the back side of the belt opposite its seamless, uninterrupted front. 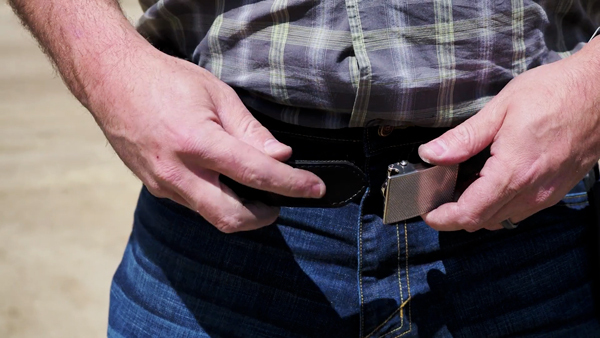 Cinching this concealed carry belt up is, well … a cinch! All one must do is insert the end into the buckle. As you continue inserting the end through the buckle you will hear and feel the teeth on the backside of the belt click their way through the catch inside the buckle. Just keep drawing the belt end through the buckle until you are satisfied with the degree of tightness on the waist. Tightened the belt too far? 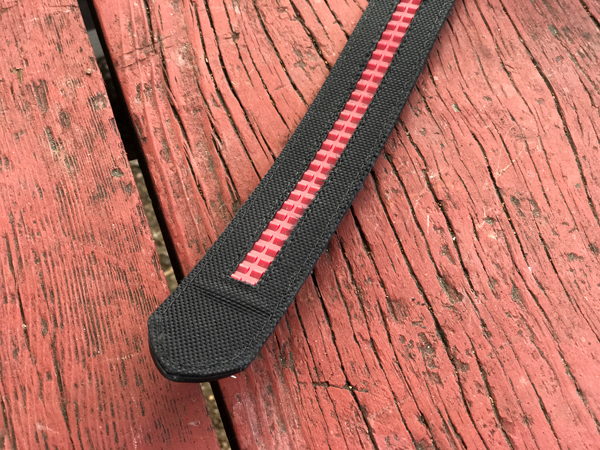 Simply grab the release (you’ll love this … they call the release a “trigger!”) at the bottom side of the buckle, pull outward and the mechanism will release allowing you to adjust as necessary until you are satisfied with the fit. *Speaking of the buckle, when you buy a Nexbelt, you can select whichever one fits your particular style or taste from a multitude of different, available designs. The belt comes in the unique clear plastic packaging sized for 50 inch waists. The belt actually measures 54 inches but the proper way to cut and size it for you is to take your current waist measurement and add 4 inches to it, then cut at the corresponding mark on the back of the belt. You want a little leeway so that you maximize the adjustability. Instructions are included detailing how to go about removing the buckle from the belt, cutting it to the correct length, and then reattaching the buckle. The buckle is fastened with two Allen set screws that pinch the belt inside the buckle. An Allen wrench is included in the packaging. Once the user has trimmed the belt down to size and refastened the buckle to it, you’re good to go. 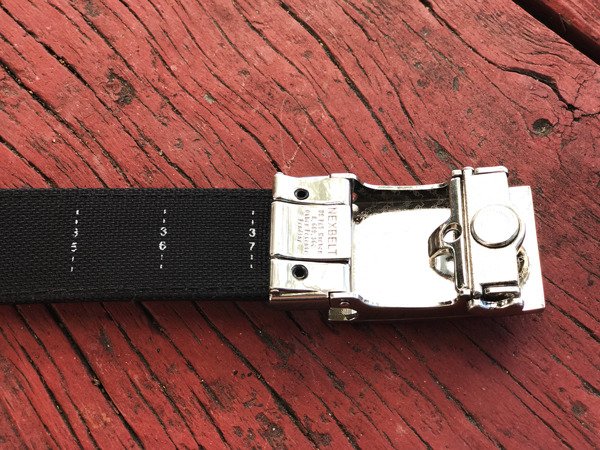 The belt I received from Nexbelt was the black leather 1.5″ width gun belt with what they call their Defender Buckle. It’s stylish, and looks good with my various clothing choices whether it be jeans, khaki’s, or a suit … especially with a suit. I might select one of their nylon versions of the same belt for day-to-day use. I have really been enjoying using the leather Defender belt for the past couple of months. It’s hard for me to remember what it was like to use “normal” belts because this is the new “normal” for me. This concealed carry belt is just so fast to put on and adjust exactly to where I need it whether I am carrying OWB or IWB for the day, or if I am going to wear a spare mag IWB as well. The belt covers the entire gamut. “So what?” Says some of you operator belt fanboys (of which club I also claim membership). 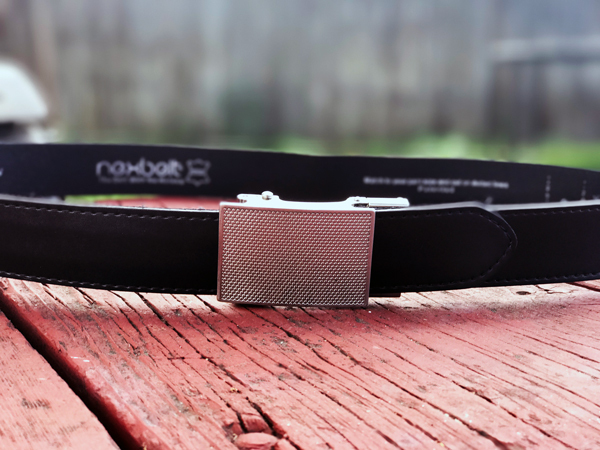 The Nexbelt really is faster to put on, faster to take off, and faster to adjust, by far. I understand that putting on a belt is really not a complicated process, but I’m a busy guy, and I like convenience. Anything that helps me get more done, faster, I am a fan of. As previously stated, each one comes from the factory sized to the 50-inch length, and I'm not sure if there’s an option to have a custom order made for larger waists. I didn’t find anything on the website suggesting a custom option. So if you are over 50 inches, sorry, but you’re out of luck. I also mentioned a few minutes ago that there are many different buckle options for you to choose from. There are even some nice patriotic-themed buckles incorporating American and Gadsden flags. I really like the look of the first responder-themed ones which incorporate a Thin Red Line (Fire) one and a Thin Blue Line (LEO) model. Very cool! Also, don’t think you’re limited to the buckles in the Gun Belt Series of Nexbelts. You can actually order “Separates” including different belt options (albeit without extra gun belt stiffening material) and many different styles of buckles. This ability also makes Nexbelt one of the most customizable belts out there on the market. Color options for their leather concealed carry belts are simple—Black and Brown. But there are quite a few color options in the nylon gun belts: Black, Coyote, OD Green, Tan (Khaki), and Realtree Xtra Camo. You should have no problem finding a color and buckle option that will work with any wardrobe combination. I’ve been wearing my Nexbelt nearly everyday in a variety of conditions. I have not tried to be kind to it. It has seen about a dozen different holsters used with it, and it is none the worse. I have no doubt the Nexbelt will hold up to solid use and last you a long time. Mine has a few scuffs and minor scratches (no doubt due to loops and clips from holsters), but honestly none of them are all that bad. Hardly noticeable. I have to really look in order to find them. Ignoring the clever patented ratcheting buckle, by itself the Nexbelt is a top quality belt product. Put that together with the brilliant innovation, and you’ve really got something special. I would highly recommend Nexbelt to anyone looking for a fast, easy to use, quality gun belt. If I had one critique it would be the lack of a 1-3/4 inch wide belt option. In my opinion a true gun belt comes in a 1-3/4 inch width. 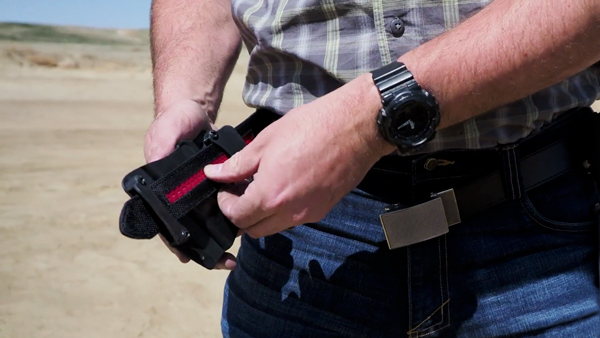 The Nexbelt is plenty stiff to keep your holster and gear secure and from twisting or “rolling” the belt. But I appreciate the ability to use a wider belt especially with some holsters like those that LEO’s might use either undercover or off duty. Some of these holsters have 1-3/4 inch loops or clips, and I hate having extra space and play in the holster on the draw. 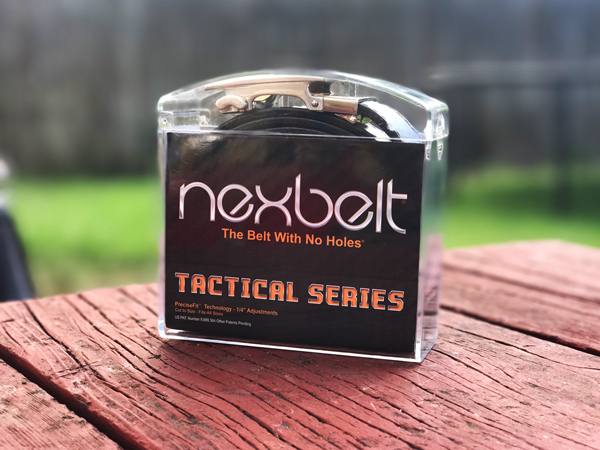 But if you think the Nexbelt Gun Belt series might be a good fit for you, I would encourage you to check them out at www.nexbelt.com. Looks like a really cool design. Sweet review! Riley, I bought one of these after reading this article and the belt I got is more like a dress belt, definitely NOT a gun belt, though that is what I ordered along with the Gadasen buckle. Now that I see your photos again, I’m thinking maybe I got the wrong belt. Mine is only about 1/8″ thick, what is your’s? It doesn’t say anything on the inside about EDC or tactical, does your’s? Mine doesn’t have any stiffeners and can be twisted easily with hands 3″ apart, can your’s? I would also comment on the fact that the ratcheting strip on the belt is actually shorter than 7″ which is the space for adjustment of a belt with holes. Doug, first of all, I apologize that somehow I missed your comment from back in July! Secondly, I don’t think mine was marked in anyway as being “tactical” other than the box it came in was marked “Tactical Series.” They definitely have a more dress belt look and feel, but I have found them to be just as durable and hardy as my more traditional gun belts. Their Nylon Gun Belts look less dressy, and I think will hold up a little better as well, so you might look into the Nylon versions as opposed to the leather ones. As for the stiffness, I think yours is the same as mine, I think. I think they are “twistable” 3″ apart. So are there stiffer belts out there? For sure. That said, I think these are stiff enough for EDC use. They’re still much stiffer than most common belts. Thanks for the questions!! 1. Belts are now stiffer than before – both leather and nylon. 5. A new clasp was designed that has a larger clamp for a stronger hold and also has set screws to pin the strap for extra security. I switched to NEXBELT over a year ago after stumbling across an ad in a Golf magazine. I did some research and found they produce a line for concealed carry or what they call their tactical gear. I bought a leather belt first and now have three all together. The two leather and one nylon option that I now use as my all the time belts. As the review said they have been durable, easy to use and work great to keep my OWB Kydex holster tight to the body. As long as the belt is being sold … I will continue to buy. Awesome! Thank you for sharing your experience, Mike.